You belong in AFP South Sound! 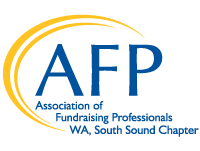 AFP South Sound (AFPSS) brings together a network of philanthropic professionals who believe in supporting and encouraging their peers to achieve their maximum potential. In addition to quality programming, we share ideas, discuss best practices, and keep each other up-to-date. Your fellow members are caring individuals like you who understand the joys and challenges of a fundraising career. You want to do your job well, develop new leadership skills, and give back to your community — and AFP Sound Sound wants to help you! AFP South Sound provides local, live educational programs featuring topics you want to master! These events are open to all, and members receive special discounts (see below). We bring in national talent as well as highlight regional experts who can help you reach the next level — including earning CFRE credits. Program discounts! Members save up to 50% off programs offered by AFPSS, neighboring AFP chapters, and AFP International, including the Annual Conference. Special opportunities only available to our members include the Chamberlain Scholarship and the AFPSS mentorship program. Enhance your skills, strengthen your network, and become a recognized leader in our region by joining one of AFP South Sound’s committees. Learn more here. AFP South Sound members love to connect and help! You can use the members-only directory (login required) to reach out to peers willing to grab coffee, share tips, and bounce ideas around. AFP International has even more members-only benefits and resources for you to access. Highlights include free webinars, trusted examples of policies and procedures, knowledgeable articles, and research on trending topics and best practices. Find all this and more at AFP International. For full details about AFP membership, which includes membership in AFP International as well as membership in the AFP South Sound chapter, visit AFP’s membership page. If you have questions about becoming an AFP South Sound member, contact our chapter’s Membership Chair, Jennifer Wolbrecht, at JWolbrecht@pierce.ctc.edu.